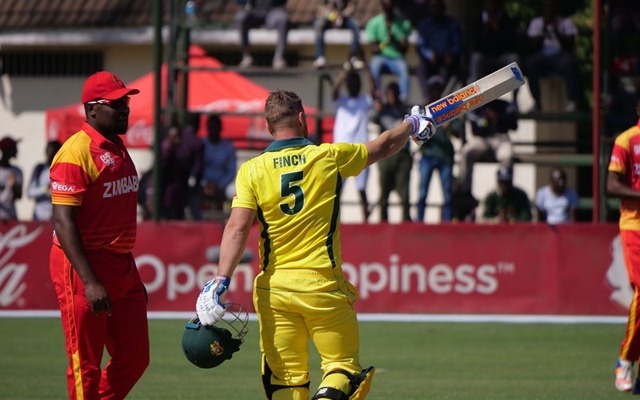 Finch scored 172, the highest individual score in T20Is against Zimbabwe. Australia won the first match in the T20I Tri-Series against Pakistan and were clearly dominant winning the match by 9 wickets. That win gave captain Aaron Finch and his team the confidence back. It was for Finch to inspire the team after their disastrous show in England where they lost all the matches on the tour. In the following encounter against Zimbabwe, the opener put up an absolute carnage with the bat. He walked out to open the batting with D’Arcy Short and farmed the strike for the most part of it. Finch played some delightful, a few disdainful and it had a damaging impact on the Zimbabwean bowlers. From the 76 balls, he faced in all 26 were hit for boundary shots. The right-hander struck 16 boundaries and 10 sixes and his strike rate only got better as the knock progressed. The Aussie skipper got to his hundred from 50 balls and thereafter it seemed as if he was just dealing in boundaries. All the Zimbabwe bowlers except Tendai Chisoro were hit for plenty. The 30-year-old bowled his 4 overs for only 16 whereas J Nyumbu spent 44 runs in just 3 overs, Ryan Burl was hit for 30 in his 2 and there was no respite for any other bowler. Finch soon got to his 150, which is his second in T20I cricket and now he had a chance to break his own record. The 31-year-old’s 156 was the highest individual score in T20Is previously and today he bettered it. Towards the end of the innings, he was in touching distance of Chris Gayle’s all-time highest T20 score of 175. But it was not to be and Finch hit his own wickets on the score of 172. His knock powered the Australian team to a huge 229/2 and are certain to win the game.